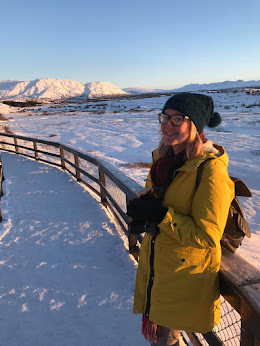 I have two children with allergies to dairy, there seems to have been a huge rise in the amount of people who have developed allergies and intolerance to dairy products. Some people recognise the signs and self diagnose avoiding all dairy products in an effort to keep the nasty side effects at bay. What they don't realise is many of these people may just have an intolerance of lactose, the natural sugar found in milk which can cause digestive problems. 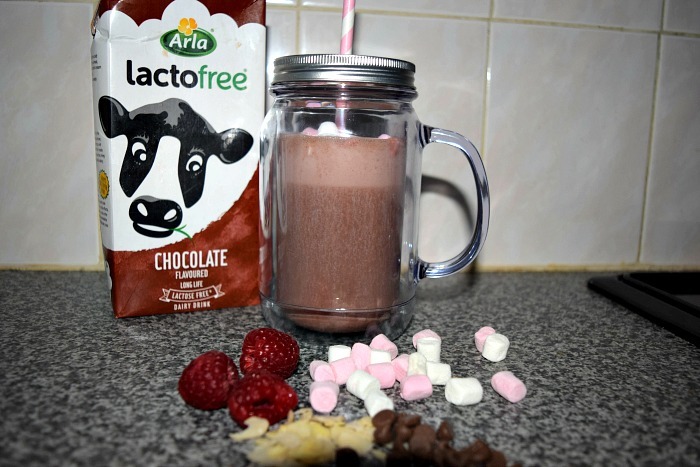 Lactofree make it possible for people with lactose intolerance to get the delicious taste of real dairy minus the lactose and as it is made from real cows milk, it comes with all the nutritional benefits. 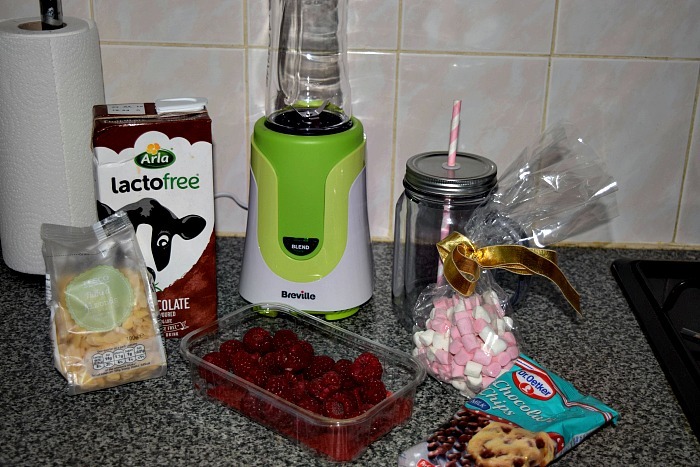 I was sent a hamper of products including the new chocolate flavour lactofree milk to experiment with and make some home made milkshakes. My first attempt wasn't great. I thought that a chocolate milkshake with raspberries and almond flakes would be lovely, I whizzed it up in my Breville Blend-Active along with some chocolate chips for added chocolate flavour ( I am not lactose intolerant which is why I added the chocolate chips, there are lactose free chocolates available to substitute). When it was ready I added it into my cute jam jar glass with some marshmallows on top to dress it up a little. The smell was really overpowering and the raspberries gave it a bitter after-taste in fact I had a few sips and couldn't drink any more. 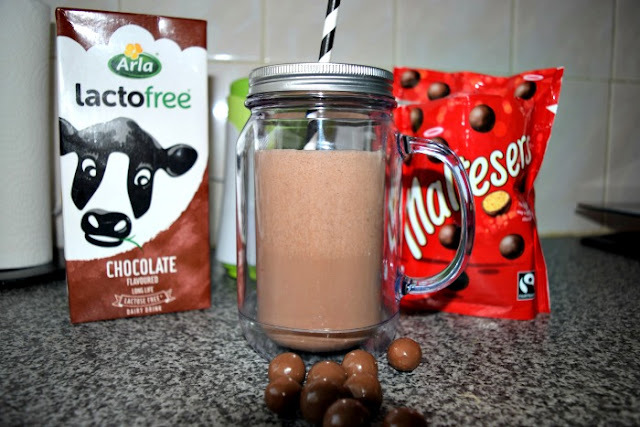 I did think it was unfair to judge the lactofree chocolate dairy drink after one bad milkshake experience though and wanted to give it another chance. This time I decided to source my own ingredients to make an indulgent chocolate milkshake. This time around, I decided to make my own Malteasers thick shake. As soon as I thought of the idea I was excited to try it. 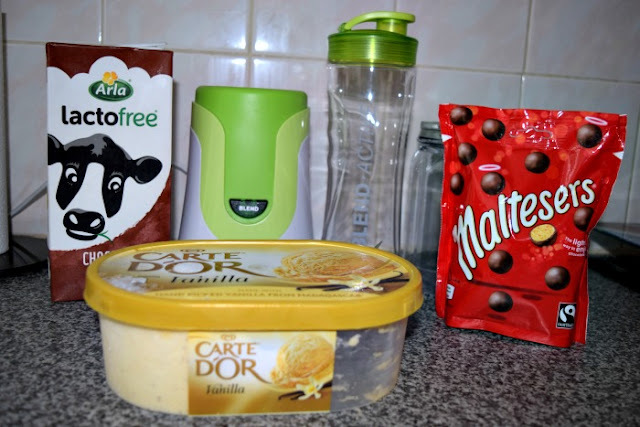 Now I was going to use our usual dairy free ice cream but had some Carte Dor to use up and I simply popped two big scoops of ice cream in the Breville Active Blend along with about quarter of a carton of chocolate lactofree and around 18 Malteasers. It took under a minute to blend perfectly. It looked and smelled amazing and tasted even better than I imagined! I was so impressed that I would definitely make the Malteaser shake again. It would be perfect for a family movie night! I have to say I was pleasantly surprised at how tasty the chocolate lactofree is. It is so creamy and tastes just like your average chocolate flavoured milk. I also used dairy products (ice cream, malteasers) but you can use your imagination and find lactose free ingredients if creating your own completely lactofree shake. If you think you may be lactose intolerant, lactofree have a short quiz that may help on their website along with lots of advice on symptoms so would definitely be worth a read. I was sent a carton of lactofree along with a few ingredients for the purpose of this post. All views are my own.